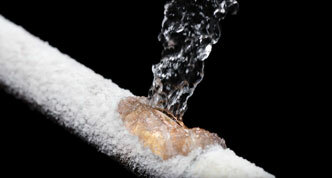 Home » How Can I Prevent My Pipes from Freezing? While we haven’t seen anything close to the extreme cold we experienced last year at this time, we still have a long way to go this winter. 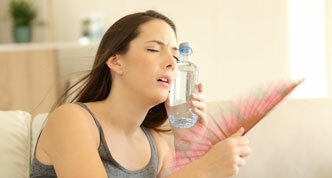 One of the biggest worries during this time of year is a lack of heat—and the ensuing danger of water pipes freezing. When a pipe freezes, it’s at risk to burst, and a burst pipe can cause you a lot of trouble and money. With that in mind, here are some tips to help you avoid this stressful situation. If you plan to be away from home in winter, leave your thermostat set no lower than 60° F.
If you haven’t already done so, turn off the water supply to your outdoor spigot, and leave the outdoor valve in the open position. Caulk or plug holes that allow cold air near water lines. Open kitchen cabinet doors to allow heat into areas where water pipes may be located. Check in and around your home for water lines in colder or unheated areas. Insulate both cold and hot water lines in areas such as your garage, crawl spaces, and your attic. Consider electric heat tape or a heated cable if the area stays cold and can’t be easily warmed up. If the cold weather is severe or sustained, allow small trickle or warm and cold water through the faucet. Leave the water faucet slightly open. Use a space heater or a hair dryer to thaw the frozen section of the pipe. Never use a device with an open flame! Keep the area as warm as possible, or wrap pipes with thermostatically controlled heat tape to keep pipes from freezing again. If you see any water coming from the pipe, call a plumber immediately. Everyone here at Wilson Oil and Propane is committed to your comfort; please contact us if there is anything we can do to help you stay safe and warm this winter.